Do you like mystery, tension, suspense? Are you fascinated by the twists and turns of the criminal mind? 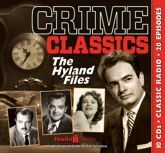 Well, Thomas Hyland (portrayed by Lou Merrill) has something for you -- twenty Crime Classics, narrated by that "connoissieur of crime" himself. These sinister plots, with provocative titles, are courtesy of Morton Fine and Dave Friedkin - and produced and directed by Elliott Lewis!